The Los Angeles Police Department has been testing two Model S P85D loaners form Tesla for a year to "to assess the vehicle's performance in our environment and to learn what are the drawbacks and positives of this type of vehicle in our fleet operation. 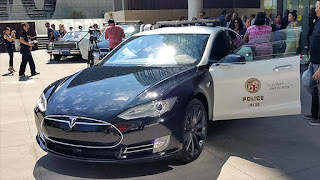 Not only on the regular transportation side, but also the future in the high-pursuit-rated vehicle arena" LAPD Police Administrator Vartan Yegiyan said. "Is it practical now? No, the next three to five years ... not only will the industry push toward electrification, but prices will drop on vehicles. More models will be coming out, and the electricity and electrical grid will become more robust, and more charging stations will be available. While that's occurring we'll be in the space learning and contributing to the process." 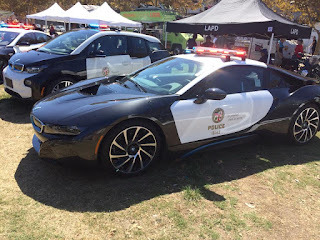 In addition, LAPD is testing BMW i3 and i8. Last year, the LAPD purchased 23 electric scooters and 3 Zero electric motorcycles for use by patrol officers, as part of the city’s commitment to build out its electric vehicle fleet. Mayor Eric Garcetti said back then the city was committed to leasing 160 electric vehicles to be used by the LAPD, Los Angeles City Fire, General Services and Los Angeles Department of Water and Power thus replacing the aging city vehicles and giving Los Angeles the largest city-owned EV fleet in the country. A hundred of the battery electric vehicles (BEV) would be used by the LAPD’s detectives, investigators and administrators. LADWP would lease 44 BEVs and 113 plugin-in hybrids, city officials said. “We already have 67 EVs in our motor pool, and will purchase even more to replace our older gasoline vehicles. 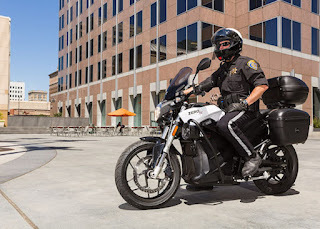 LADWP’s motor pool also includes plug-in hybrid trucks – which are not only better for air quality but quieter and therefore ‘friendlier’ to the neighborhoods we serve” LADWP General Manager Marcie Edwards said in a statement.